In this personal injury case study, we are looking at a claimant who suffered lower back injuries whilst carrying out his duties at work. During and immediately after lifting an engine, the claimant felt several lower back injuries and symptoms of tissue damage. The claimant sought legal advice for their lower back injuries at work and were advised to take legal action against their employer. In this case, the employer, or defendant, did dispute part of the allegation and the severity of lower back injuries at work caused by lifting the heavy item. As such, this case did need to progress to the courts for a judge to decide the amount of liability the employer had, as well as the value of compensation which should be paid. Whilst the majority of personal injury compensation claims can be amicably resolved between the claimant and defendant, a small minority of cases need to go to court. Legal Expert work with a panel of experienced personal injury solicitors from around the country who have the specialised skills to help people bring compensation claims against their employer. The solicitors we work with have helped in clients with similar lower back injuries to recover the damages they are owed by an employer. Read the case study below where we look at how solicitors helped a person with a Lower back injury at work to recover the compensation he was owed by his employer. How Did The Lower Back Injury Happen? 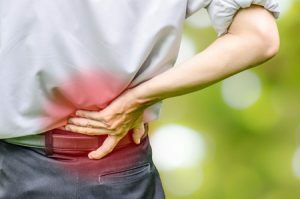 In this case study, the claimant alleged that he had sustained several lower back injuries, including a soft tissue strain and damage to one of his vertebral discs. The circumstances which led to the lower back injuries at work involved the claimant lifting the mounting for an engine. The claimant alleged that doing was the cause of an acute strain in his lower back. The claimant went on to allege that a later prolapse of the L4/ L5 intervertebral disc was a direct result of the sprained back he suffered at work. The claimant subsequently also had to deal with the onset of sciatica which he linked to the prolapsed L4/L5 disc. The lower back injuries included signs of a pulled back muscle as well as a prolapse of the L4 and L5 discs. As well as the signs of a pulled back muscle, the claimant also suffered further injuries. The claimant alleged that the prolapsed disc had also led to other symptoms and conditions. Lower back injuries and symptoms can lead to (as in this case) problems in the bladder and erectile dysfunction as well as wider neurological issues. The claimant alleged that all of these had been caused by the initial lower back injuries from lifting. Lower back pain can be especially common across a variety of different professions from those involving manual handling and lifting through to office workers or anyone sitting for extended periods of time. The Health and Safety Executive has a plethora of advice and information for both employers and employees on how to deal with back pain in the workplace. They have guidelines on how employers should act, such as the training which should be provided to employees, to mitigate and reduce the risk of back injuries. Lower back injuries and treatment options are highly variable. Pain in the lower back can often be resolved within a few weeks or months. How, ver in some cases, lower back injuries and treatment can take much longer to resolve the underlying condition. The NHS has resources for lower back injuries and exercises that you can perform at home to relieve their symptoms. However, as with any injury recovery, when treating a lower back injury you should always consult a GP or specialist doctor before starting them. What Did The Allegation Include? The allegation was based on the accusation that the claimants employers had not provided a safe way to work and that the way he was shown to move equipment breached manual handling regulations. As such, his solicitors alleged that the lower back injuries were caused by the way in which he moved the equipment at work. However, the claimant and their solicitors did admit that the claimant did already have a pre-existing pain in the lower back. Their claim alleged that the earlier back pain had not lasted very long, and that they were resolved before the lower back injuries occured in the workplace. The claimant’s solicitors alleged that the prolapsed disc was the direct cause of the subsequent erectile dysfunction and other neurological issues. The claimant was 51 years-old when the accident happened and 57 year-old when the case reached a trial. The judge awarded a total of £5,000 in compensation for the claimants lower back injuries. This was made up of £2,530 which was awarded for the pain and suffering the claimant felt, as well as their loss of amenity. This covered a period of six months of pain and suffering. It also accounted for a good level of recovery within two months of the accident. Whilst the claimant was suffering from the initial pain, he was unable to carry out some usual household tasks as well as some of his usual leisure activities. The total compensation award took all of this into account. Legal Expert work with specialist no win no fee solicitors. We offer the claimants who we work with a comprehensive, no win no fee legal service. Our no win no fee solicitors work with you using what is called a ‘contingency fee agreement’. These are also known as a conditional fee agreement, or CFA. They are a special type of legal contract used by solicitors where the claimant is not able to make an upfront payment. It sets out the work the solicitors are expected to carry out for the claimant. The no win no fee agreement also sets out a schedule for when and how the solicitors will be paid. As well as under what circumstances the fees are due. CFA agreements allow claimants to hire a solicitor without being asked for, or being charged, upfront fees and costs. They can be very beneficial for claimants as they don’t need to take on any kind of financial risk. If the no win no fee solicitor you hire is unable to secure your damages, you won’t have to pay anything. Legal Expert is the UK’s best online resource for finding information on making a successful personal injury compensation claim. We have a wide range of different guides, case study examples, and useful articles. Our selection of resources are created with you in mind and are written to help illustrate the best way to pursue claims for lower back injuries. Our case study illustrates how a specialist solicitor can play a crucial role in resolving a case satisfactorily. To start your personal injury case today, talk to the specialist team at Legal Expert. You can find out how our dedicated no win no fee legal solicitors can help you to claim the compensation that you deserve after an accident. Whether you were injured in an accident at work, or elsewhere, our team can help you. Call Legal Expert today by phoning our team on 0800 073 8804 or by emailing us at info@legalexpert.co.uk. You can start your claims process by using our online form. Find out how to make a successful claim for a back injury, whether suffered in the workplace or anywhere else with our comprehensive guide to back injury claims. Resources from the Health and Safety Executive about preventing and managing back pain in the workplace.